No credit history. 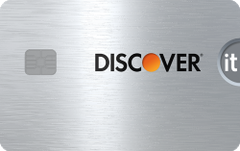 Like the Discover it chrome, this card is perfect for gas stations and restaurants, with 2% back on those categories up to $1,000 a quarter, then a cash back match at the end of your first year. See more of the best student credit cards. Our take: The Discover it® Student chrome zooms to the top of the class because of its winning cash rewards program and user-friendly features. Ratings and reviews provided by issuer as of 2018-01-05.